Gino Berthiaume, 16, has made considerable progress since WPS agreed to send him to a residential school program. This article was originally published in the March 5, 2017, edition of the Sun. All it took was a small pepperoni, onion and mushroom pizza to see how far Eugene “Gino” Berthiaume had come in a year. As Gino was counting his own, hard-earned money to pay the Kelley Square Pizza delivery person, his mother, Kelly Rawson, opened the box to find the aforementioned toppings. Which would have been fine — a classic combination, indeed — except, Gino had asked for broccoli rather than mushrooms. Ordering broccoli on a pizza is rare for most 16-year-olds. Even less likely for many teens would be a mature and rational response to the topping turmoil. Gino instead shrugged his shoulders at his mom’s revelation, finished counting his money, and soon would be enjoying his lunch — mushrooms and all. Using American Sign Language and beaming a wide smile, Gino pointed out to his mother that he didn’t get bothered by the mistake. “He’s remembering back when he didn’t cooperate. So he knows the difference and he’s proud of himself,” Rawson said. Gino, with his mom Kelly, home for school vacation. Gino, indeed, isn’t like many 16-year-olds. He is deaf and suffers from developmental delays, epilepsy and cerebral palsy due to a virus contracted at birth. Over the past year, with the benefit of a residential school program tailored to his needs, Gino has learned not to get angry over such minor details. (Last winter he would have refused to eat the pizza, or cooperate in general, Rawson said, for quite some time afterward.) Spending this past February school vacation with his mom, he didn’t seem to have a care in the world. Mere months ago, everyday life for Gino wasn’t so simple, and such frustration would lead to aggressive behavior. He lacked the skills to take care of himself, had no patience for things like waiting his turn, and obsessed over single subjects. Rawson is quick to credit The Learning Center for the Deaf in Framingham, where her son began the school year in his new program after a years-long back-and-forth with Worcester Public Schools over the appropriate special education plan for Gino. “The difference is incredible. The amount he’s willing to do on his own is much more than just a year ago,” Rawson said. The Sun last reported on Gino back in March 2016, and since September he has been a student in the residential program at The Learning Center, where he stays overnight every Monday through Thursday during the school year. As Gino eats his pizza and watches highlights of the New England Patriots Super Bowl LI victory, and the Boston Bruins loss from the night prior, Rawson reflects on just how far her son has come. 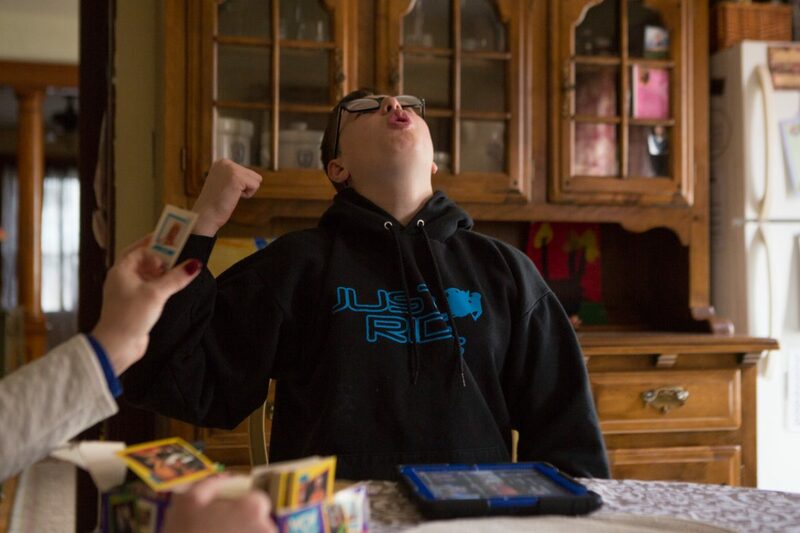 Gino enjoys a winning hand while playing a card game with his mom. Getting to this point, though, was an uphill battle. Through School Choice, Gino has been attending the Marie Philip School at The Learning Center since he turned 3. Starting in 2014, Rawson had pleaded with Worcester Public Schools, which pays for his education and outlines and monitors his progress, to agree to move Gino into the residential program to help address his learning deficits. 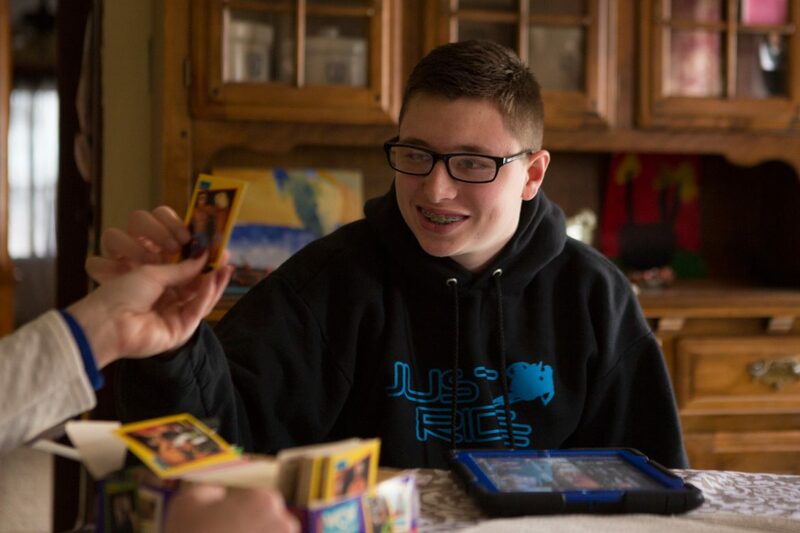 For students like Gino, the school system’s special education department drafts an Individualized Education Program (IEP). As part of that plan, Rawson initially agreed with WPS to have an Applied Behavior Analysis (ABA) therapist provide in-home services five days a week for 1.5 hours per day. However, those services went unfulfilled for nearly two years because, as the Sun reported in November 2015, the school district said it could not find an appropriate and qualified candidate to work with Gino. In December 2015, the Massachusetts Department of Elementary and Secondary Education contacted both Rawson and school officials with concerns regarding the noncompliance of Gino’s IEP. The state education department conducted its own investigation and pushed WPS to make proposals for corrective action with regard to Gino’s education plan. The school district responded with a proposal to reduce Gino’s in-home ABA therapist services from five days a week to three. In other words, the schools maintained that therapist-augmented day services would suffice and the district didn’t see it necessary to pay for both Gino’s in-home services that he still wasn’t receiving, and pay for the tuition costs associated with the residential program. According to data from the Operational Services Division of the Massachusetts Executive Office for Administration and Finance, for a single student the annual tuition rate of the day program at the Philip School is $80,345.16, or $405.78 per day. Now that Gino attends the dorm program, that cost rises to roughly $88,000 annually, or $444 per day. Gino, in his room at home. Finally, on March 18, 2016, the Worcester school district approved Gino’s enrollment into TLC’s residential program in the wake of not being able to find a qualified ABA therapist, and in the hopes of making up hours lost from Gino’s unprovided in-home services. By Gino attending the dormitory program at TLC, it allowed Worcester schools to make up for the services it failed to render last year when it recommended through Gino’s IEPs that he receive in-home and school-day services from applied behavioral and occupational therapists. Samantha Kistner worked with Gino on independent living skills for three months. However, just recently, Kistner had to step down for personal reasons. Worcester school officials, including Superintendent Maureen F. Binienda, would not comment on Gino’s IEP and services and how the district would collaborate with The Learning Center to replace Kistner’s work, citing the Family Educational Rights and Privacy Act (FERPA) and student privacy concerns. “I feel that meeting all IEPs should be a priority and I believe [Human Resources] has even made attempts to cast a wider net for specialists,” McCullough added. Nonetheless, Gino, via sign language through Rawson, said he loves living at school, has made many new friends, and the most important thing he has learned in the past several months is being independent. Since Gino started spending four nights a week at the school in September, he has become much more independent, more active, and has taken on several new interests, including art, according to Rawson. Gino recently won a prize for his artwork at The Learning Center. Berthiaume, 23, a team leader and heavy chore worker for elder services with Associated Home Care, said he’s noticed that his brother’s maturity and self-confidence have rapidly increased in the past year and he’s happy that Gino shares his love for art. Berthiaume, who specializes in spray paint art — making abstract art and murals — says Gino has exceptional talent. 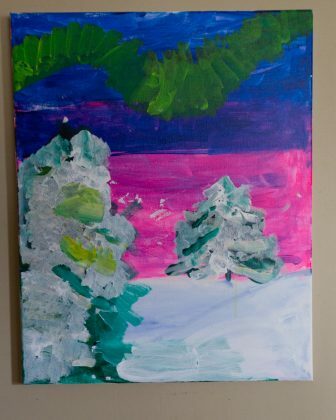 Gino is inspired by his older brother so much so that he entered an art contest at school and earned third place in his division with the piece, “Cow! In sign language,” on which he used colored pencils, markers and watercolors. Additionally, through TLC, Gino has taken on a paid internship — where he earns his pizza money — as a studio assistant at Expressions Art Bar in Southborough. As a studio assistant, Gino works with another deaf employee and is responsible for different tasks including washing brushes, organizing paint bottles, setting up for events, taking out trash and recyclables, unwrapping canvases, washing windows, setting up display tables and restocking paper goods. Mary Simmons, owner of the painting and event studio, and former art teacher at The Learning Center, remembers Gino as a student and is impressed by how far he has come since moving to the residential program at TLC. Gino, with mom Kelly Rawson and brother Jerrad Berthiaume. According to Simmons, Gino loves being at Expressions and enjoys working with Laurie Blanchard, an employee at the studio who is also deaf. “He listens well and is enthusiastic to try various tasks. He is no longer letting any physical barriers in his way and will speak up if he needs assistance or clarification. I look forward to seeing him learn more job-related skills that will assist him in the future,” Simmons added. When Gino isn’t working hard at Expressions, he stays busy each day at school working another internship at The Learning Center’s science lab, where he is required to clean the lab equipment. Additionally, at school Gino is learning how to do laundry, cleaning, food shopping and cooking. He’s learned to cook all of his favorites: pasta, macaroni and cheese, tacos, burgers and hot dogs. “Gino is still working on many other skills — cooking, cleaning, shopping, hygiene. I am proud of his work ethic and his positive attitude, but we have his parents to thank for that,” Kistner said. When he’s home on the weekends — Rawson and Gino’s father, Gene Berthiaume, share weekend responsibilities — Gino likes to go sledding and tubing, watch WWE wrestling, and go bowling, one of his favorite activities. “It’s whatever he wants to do. He’s so busy during the week so we can do whatever he wants. Some weekends he doesn’t want to do anything but chill out,” Rawson said. This Saturday, March 11, Gino will compete in the 10-pin bowling event of the Special Olympics Winter Games at the Auburn AMF bowling alley. “Gino’s really looking forward to that. He does every year. He’s competing with other students and his friends from school and this year he’s hoping to win a medal,” Rawson said. Today for Gino, life is good. He has his eyes on the prize — not just a bowling medal — to continue learning to be independent, spending time with his family and friends, watching football and professional wrestling, and being a regular 16-year-old kid.